This is not the ideal winter driving setup, but does it work? 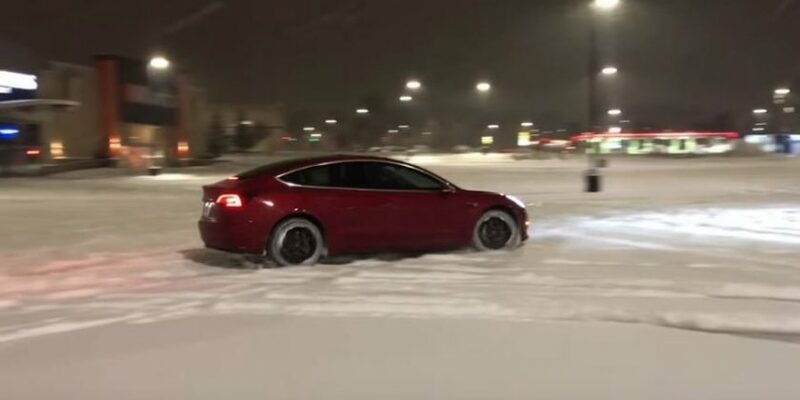 We’ve heard the Tesla Model 3 fares well in winter driving, but what about the RWD version with no snow tires. Let’s see how it performs on the slick snowy stuff. Relying mainly on Tesla’s traction control system, the Model 3 sans winter tires seem to handle the slick stuff rather well. Despite repeated attempts to do some spins, the Model 3 resists. Admittedly, the car doesn’t appear to accelerate all that well, likely due to poor tire traction and the traction control system stepping in quite often. Additionally, the braking performance seems to be less than desirable. But, that could be corrected with some proper winters tires and / or by choosing the AWD variant of the Tesla Model 3. Remember when traction control didn’t even exist or was only available on expensive foreign cars? Well, back in those days, RWD was downright scary in the slick stuff, but now, along with snow tires and traction control, winter is no match for RWD. We already know the Model 3 fares well in the snow. This comes as no surprise since the car is heavy, has outstanding weight distribution and a very low center of gravity. But if you want the ultimate snow-going Model 3, opt for AWD and fit it with some proper winter tires. Mark takes the RWD Model 3 into the first snow of the year to test the all-season tires and traction control in southern Ontario.